Finding Function Intersections – Casio fx-9860GII vs. TI-84 Plus: Casio IS Easier! I admit to being a TI-83/84 user for all of my teaching. Not because I had a personal preference for a TI, but because it was what all the schools where I taught in Virginia provided and recommended. It was in our books, it was what our state tests recommended, it’s what we were told to tell students to buy. Why? Was TI better than a Casio or an HP or any other brand for that matter? No. It wasn’t…and isn’t to this day. But – TI knew how to play the market and basically embedded themselves with publishers, testing companies, schools, to the point where today, schools & teachers & publishers are convinced TI is the better calculator option. Or maybe I should say they think it is the only option. It’s not. It’s an option. But it’s not the better option in terms of cost and in terms of ease-of-use. In my 25 years of using TI, I can honestly say I still forget how to do most operations because there are so many steps involved or I can’t remember where the menu item lives. Obviously, as the Casio Brand Ambassador, I have a definite bias in my current opinion about hand-held calculators. However, it wasn’t my opinion until about 7 years ago, when Casio approached me, in my role as Director of PD/Education Outreach at Key Curriculum, to get some advice and suggestions for quality trainers who could help support Casio PD efforts. That’s when, for the first time, I actually used a Casio calculator and realized it was really easy and quick to learn – and I could remember things!! All the Casio PD teachers, many who were also Key trainers and who teach in classrooms all over the country to this day, were former TI users as well. But, once they tried Casio, never looked back and encourage others to make the switch as well. In my new role, I’ve been asking these teachers why, and the first answer I always get is “it’s so much easier for the kids to use and they remember how to use it”. The second answer I always get is “they are much better calculators in what they can do”. In European countries, Casio has a much bigger share of the market than TI – they know about quality and ease of use. Here in the U.S. we are fighting the TI machine…it’s so embedded in our math culture and it’s hard to change, as are most things in education (think Common Core!) As Terry Walsh said in his NCTM session in Atlantic City, something a college professor told him, “Casio calculators are much more user friendly, but TI calculators are more user familiar”. Sticking with the familiar and avoiding change is a disservice to our students, who deserve technology tools that are affordable and intuitive to use. I thought it would be a fun idea, since Casio is always saying how much easier it is to use a Casio vs. a TI calculator, to actually show how. I picked two comparable graphing calculators: The Casio fx-9860GII SD ($79.99) and the TI-84 Plus ($139.00) to do a side-by-side comparison of a relatively common algebraic skill – finding the intersection of two functions. (Note: This is NOT a lesson on teaching this algebraic concept, so please, please, do not think this is how I would help students understand how to find the intersections or what those intersections represent in real-world context. There is a whole lot of discovery, hands-on learning, conversations, etc. that would occur if this were an actual lesson). What this video demonstrates is a step-by-step “how do you find the intersection of two functions using each graphing calculator” – nothing more, nothing less. The point being to actually demonstrate, talk-the-talk, walk-the-walk, and show ONE example of how a Casio graphing calculator is easier to use than a TI graphing calculator. 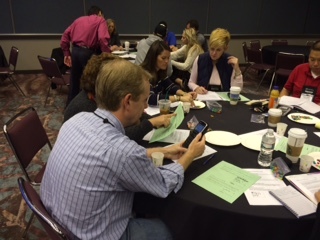 It was so nice to be back at NCTM Regionals and connect with old friends and make some new ones. I had a really great time in Atlantic City (no gambling was involved!) 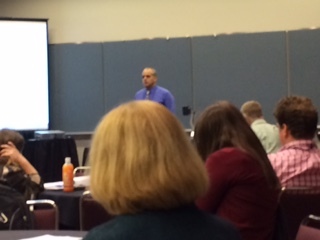 Really happy to see The Math Forum folks up front and center as part of NCTM now, out there doing what they do best – making math engaging, thought provoking and relevant. I also ran into a lot of my former colleagues from Key Curriculum, which was a pleasant surprise and made me miss all the rest of them! I got to meet some of the Casio team, both sales folks and teacher trainers, and see and hear some of the things they are doing to help teachers use Casio technology in the classroom. I learned quite a lot from the few sessions I was able to attend as well as learning from the folks in the booth, so feeling even more excited about supporting teachers calculator usage in math instruction. 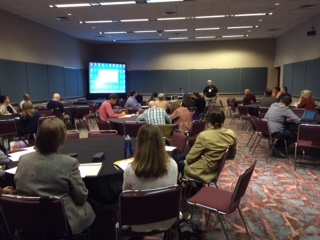 I met Terry Walsh, a teacher from Colorado, who had a very thought-provoking session showing how released AP Calculus questions could be used with students in grades 6-12. It’s all about the questions you ask, but sixth graders can be doing integral calculus. He really emphasized how the Prizm calculator, with it’s advanced features to modify and show different parts of the graphs or slopes, could help even young mathematicians make conjectures and connections about mathematical situations. Unfortunately, Terry won’t be at the next two NCTM regionals, but if you get a chance to attend one of his sessions, definitely do so. You’ll do some thought provoking math, experience the Prizm, and see how easy it is to visualize and help students make connections. 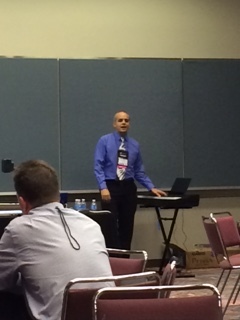 Mike Reiners, a teacher from St. Paul, Minneapolis, really made the music & math connection, showing how to create functions from songs and then transforming those functions – again, all through the understanding of music. It was fascinating and amazing to hear the music on the Casio keyboard, see the song represented as a function on the Prizm, and then, as see the transformation, understand how that impacts the function equation, and then hear how the transformation changes how the song sounds. I also loved how involved the teachers in the session were – most of whom did not have any musical training, yet were able to create the Parsons Code for a song they chose, convert this to a list of values, and then use the Prizm graphing calculator to generate the corresponding list and graph of the function. And, after some cool melodic playing from Mike, understand how to transform the functions. Students, who we all know love music, would really be able to relate to this approach to understanding transformation of functions, because they can hear and visualize at the same time. If any of you are planning to go to the NCTM Regionals in Minneapolis or Nashville, Mike will be doing his “Think Like a Synthesizer: Applying Algebraic Transformations to Music Melodies” session at both, so be sure to go. One of my favorite sessions was with Tom Beatini. First, I was impressed at the crowd that showed up at 8 am on a Friday morning – 44 people. Go math teachers! 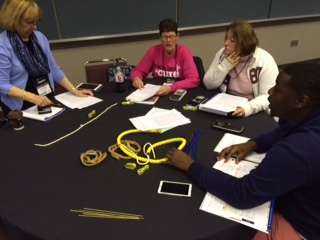 But, what made this session so great was all the math going on – three different data-collection activities, hands-on inquiry with ropes, M&M’s, and cheerios, and appropriate technology integration using the Prizm. Everyone was involved, talking, and learning from each other. What I think I loved the best was the TI-graphing-calculator users who made the effort to use the Prizm graphing-calculators and experienced for themselves how easy they were to use. I appreciate their willingness to step out of their comfort zone. 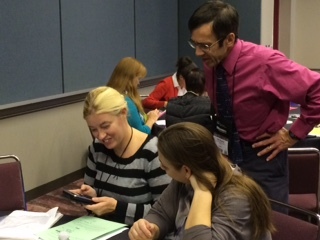 Tom really made the effort to connect the Common Core Math Practices and help his participants focus on the importance of mathematical conversations, questioning and presentations that support justification and solidify understanding. 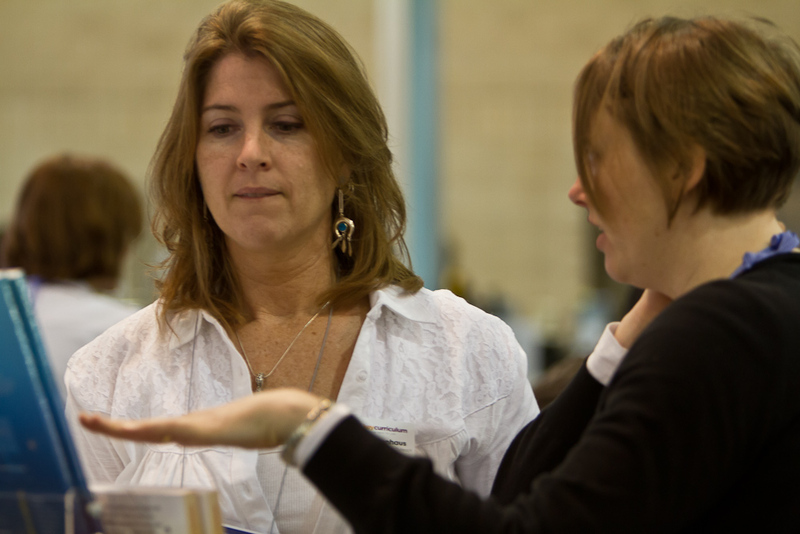 Again, if you are heading to NCTM in Minneapolis or Nashville, be sure to catch Tom’s session “Hand-held Technology + Hands-on Activities = CCSS Success”. All in all, it was quite fun being back learning and connecting with math educators again. 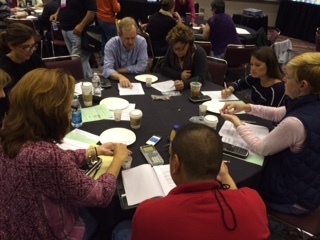 I am looking forward to NCTM Regional in Minneapolis, coming up November 12 & 13. I hope to see a bigger crowd, experience some more great sessions, and connect again with old friends and new. Hopefully I will see some of you there! Calculators – A Thing of the Past? Are calculators a technology tool that has outlived its usefulness? Obviously, this is a loaded question. In theory, you would think the answer is yes – what with all the one-to-one initiatives, use of mobile devices in schools (particularly smartphones), free online graphing tools, and the push for web-based apps and resources. But, the reality, from both my research and my personal experience working in schools all over the country, is the answer is no. Calculators are still a much needed technology tool and will be for some time to come. How can that be you ask, what with so many schools all going digital? 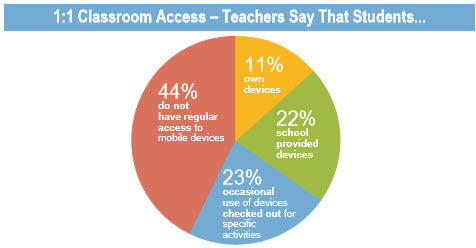 According to the 2013 SpeakUp National Research Project, only about 1/3 of students have regular access to mobile devices to use in classrooms (of which some are BYOD). Most of the time, there is no regular access to mobile devices (i.e. laptops, tablets, smartphones, etc.). Which means, from a math perspective, most of the time there is no access to math apps, or online graphing tools, or calculation/graphing tools on mobile devices. From my personal experiences, working in large, small, rural and urban school districts, technology in classrooms runs the complete gamut – some schools have great technology – white boards, laptops, and/or tablets, internet. But – that is the rarity. What I see most often is a laptop or tablet cart that must be shared between six or more teachers, or possibly one computer lab, which is often impossible to get into, especially with all the standardized testing that happens. 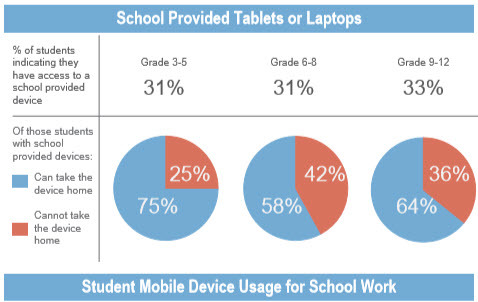 Students are more often than not unable to use their own mobile devises(i.e. smart phones). Even teachers are often not allowed to, and if they are the internet access is horrible. Just last week I was in a school where the teacher was trying to access something on her phone and had to hold her phone out the window. What technology is available can also differ drastically from school to school within a single district, not just between districts. I have gone from one school in a district, where the only technology available was calculators and the teacher computer & projector, to the school down the street where every student had a laptop. Same district, same grade level (high school), vastly different resources. According to research, 97% of teachers have a computer in their classroom. The most used technology resources in classrooms are an interactive whiteboard and a class computer with a projector. My personal experiences confirm this – and in fact, it is what I see used more than anything – teacher computer, with a projector./screen. And sadly – the interactive whiteboards I see are used more often as just projector screens rather than truly utilizing their interactive capabilities and built-in programs. Funding is one of the biggest reasons for the lack of technology in schools, with a huge disparity in access between lower and upper income schools (This Pew Research Study has some interesting numbers/facts). Sometimes is poor planning for implementation and/or the infrastructure needed to sustain technology initiatives (L.A. a great example of this). It is also lack of training and support for teacher’s integration of technology, as well as other factors such as large class sizes (I’ve done research in class sizes of 43 high schools students), comfort level with other resources and of course, just the availability of resources in general. So, while I am a supporter and believer in using mobile devices such as tablets, laptops, smartphones, in the the classroom, I am also a realist, and know that we are a long, long way from this being common place. Especially as funding for schools keeps getting cut, which means purchasing costly tablets and/or computers and maintaining these is often a challenge. So – unless somehow, educational funding makes a huge turn-around, which in this political climate is very unlikely, I don’t see all students having regular access to mobile devices in classrooms for a long time. Which takes me back to the calculator. A cheap and easily-accessible technology resource that most schools have and, due to their relatively low cost (especially compared to a tablet and/or computer) that most parents can purchase for their children if need be. A $50 graphing calculator can allow students to explore and visualize different types of relationships, discover numerical patterns, and expand their conceptual understanding of mathematics. A $20 calculator (ClassWiz) has QR code generation capability that allows for graphical representation (teachers could project them from their class computer). Calculators can be in every students’ hand, quickly, vs. the sharing of mobile devices that often occurs when mobile devices are used in classes (due to availability) (average computer/tablet to student ratio is 1 to 5.3). I am going to continually learn and push for technology integration in mathematics and hope that students will have access to all the great technology and mobile devices and resources out there. It’s just a slow process with lots of hurdles such as funding, access, permissions, etc. So, I am going to push the use of calculators as well because, from my perspective, calculators are NOT going away for a very long time. If it’s a choice between no technology or an affordable calculator that will help push students further and support the exploration and deeper understanding of mathematical concepts, it seems a no-brainer – get a calculator and help students explore! It’s a big reason behind my decision to partner with Casio. I do not see calculators disappearing from math education any time soon, and I really like Casio for several reasons, some of which are they are cheaper and better calculators that are a heck of a lot easier to use. I also get to be a part of helping Casio develop and evolve both their calculators and their web-based solutions, and interact with math educators around the world, so I see all this as a win-win! I have just come on as Casio America’s Brand Ambassador, a part-time position that will be evolving in the next several months. As I explore my partnership with Casio, my main goal is to help share with math educators how Casio Education and its technology products can support mathematics teaching and learning in a variety of ways. 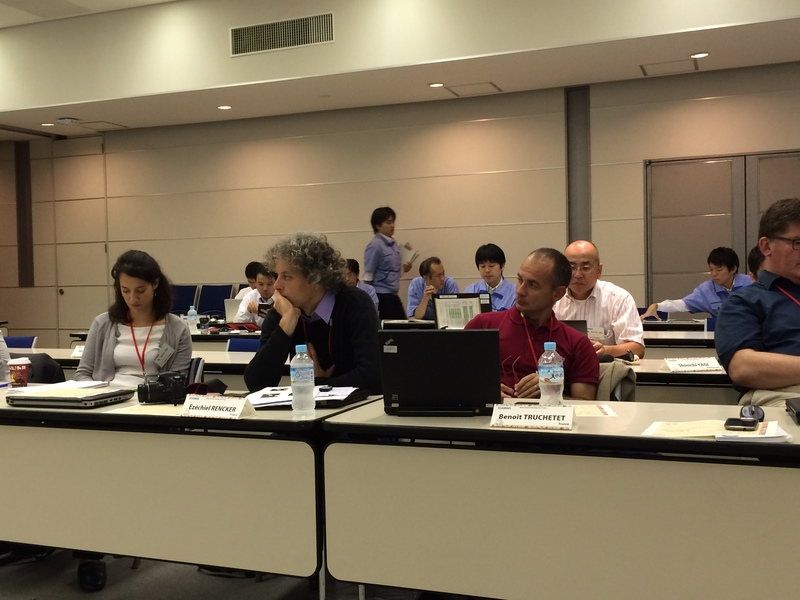 As my first endeavor in this position, I was lucky to be included in Casio Internationals’ 11th Global Teacher meeting at the Casio Research and Development offices in Hamura, Japan (outside of Tokyo). 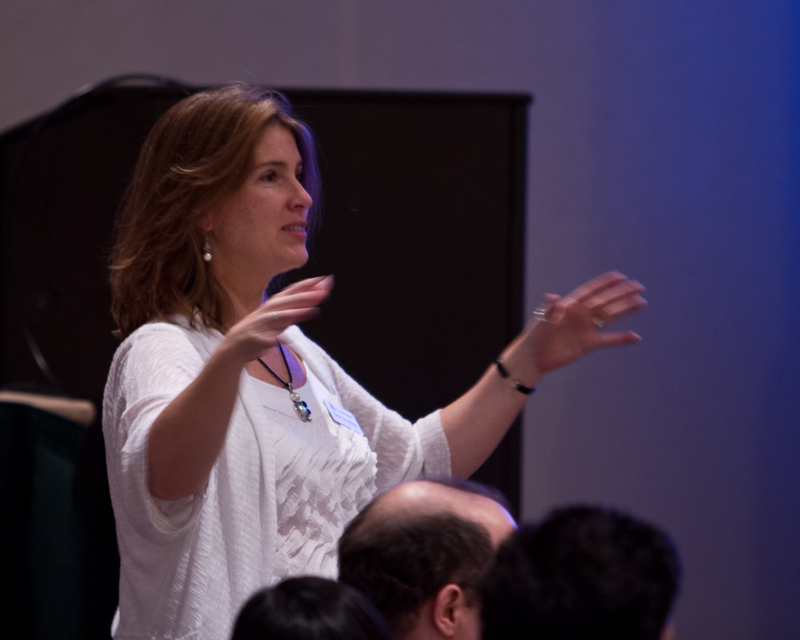 This was a two-day meeting that included the R&D engineers, teachers and Casio managers from all over the world, coming together to share new ideas in how to improve and create new Casio products that support mathematics. The goal of this collaboration, using ideas and real-world anecdotes from actual teachers using the tools as well as creative ideas from the R&D engineers, was to focus on what is best for students and teachers, and how Casio can enhance technology integration in mathematics education. 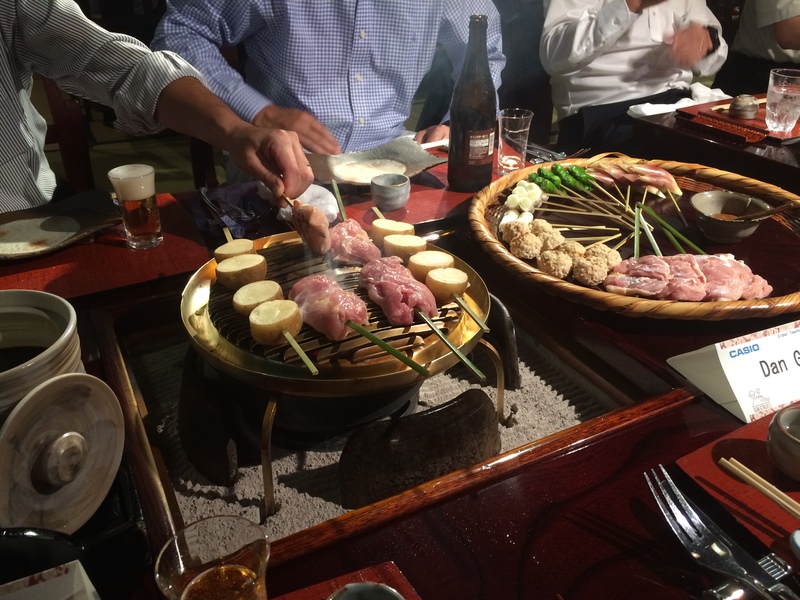 There were many truly memorable things from this whole experience, including meeting teachers from all over the world (Australia, France, Germany, Finland, Middle East, Singapore, India, Japan, U.S.), exploring Japan for the first time, and eating some food I never thought would pass my lips (i.e. squid, octopus, urchin, jellyfish, and sharkfin, & bird-nest soup). 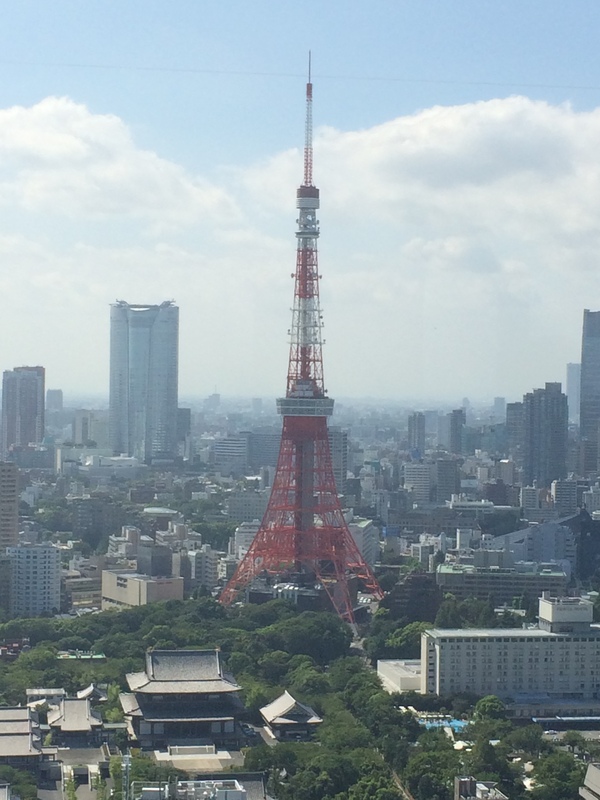 My experiences in Japan were diverse and informative, with a little crazy fun sprinkled in, such as experiencing Karaoke the Japanese way, in a room with a stage and microphones (be thankful that I am NOT sharing the video of that experienced!) The most apparent aspect of Japan, if you have never been, is how amazingly kind and considerate everyone is. I never felt as well-taken care of – from the hotel staff, to the Casio employees, to the strangers on the street who, though they did not speak English, were willing to change their direction and walk the lost American to the train station. The Japanese people are generous to a fault and my time there was just lovely. On the work side of things, my biggest take-a-way from the Casio Global Teacher Meeting was how diverse mathematics instruction and technology use is throughout the world. It makes me really question, even more than I already did, the comparisons of student math achievement between countries since how, what, and when mathematics is taught is so incredibly different. (THAT is a post for another time!) For this post, I thought it would be interesting to share some of the things about Casio Education/calculators that I learned as a result of this trip. First – did you know that the first Casio calculator (14-A) was made in 1957 and is still working? (Being the confirmed math geek that I am, yes, I did get incredibly excited when I got to see the calculator in the lobby of the Casio R&D research facility). It can do the four basic operations with numbers up to 14 digits. 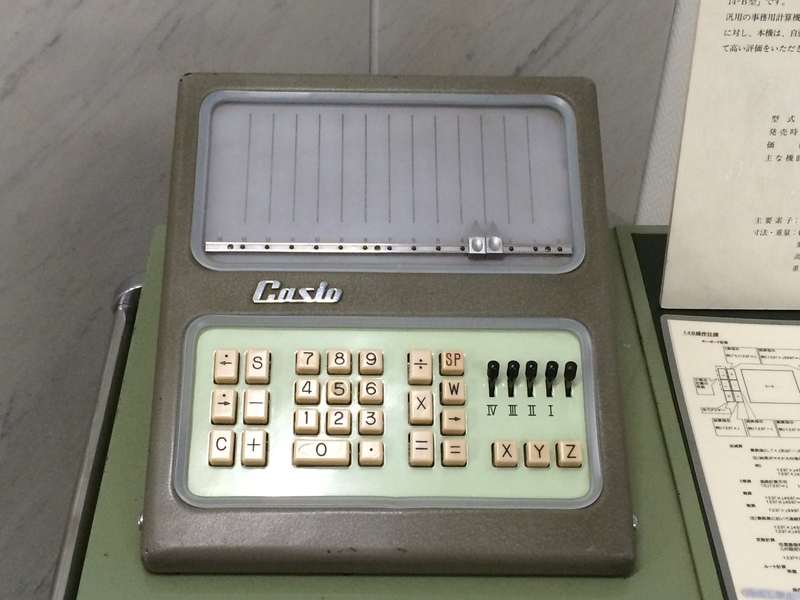 In 1965 Casio made the world’s first electronic calculator with a memory function, which they started exporting to the US and Europe in 1966. Second, Casio calculators have a larger share of the market in European countries. European countries have a Ministry of Education that makes technology decisions for the entire country, as opposed to the United States, where each school district, and sometimes each school, makes their own technology decisions. Third, Casio’s ClassPad calculator (CP400 & CP330) seemed to be, based on the teacher’s present in this meeting, the most-used graphing calculator in these countries, and used in remarkable ways. It is a pen-touch-screen calculator, with drag-and-drop menus and so many other advanced functionalities. In the U.S. this calculator is not yet approved by the College Board for use on SAT & ACT, so it’s not as prevalent here – but boy, it should be! Fourth, the real-world applications of mathematics in these other countries seems to be much more of a push than here in the U.S. 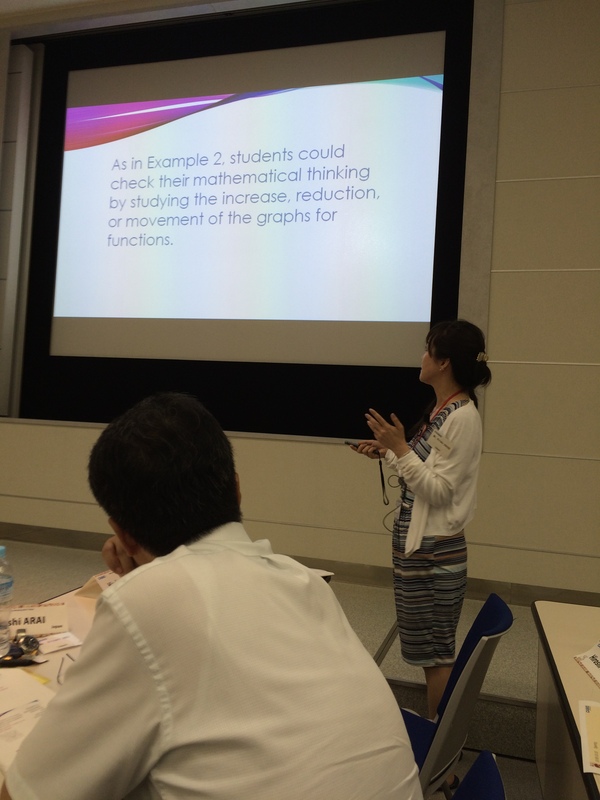 The Japanese teacher shared a typical problem with us that students are expected to solve in mathematics on a regular basis (with no calculators, which is astounding!). All I could think, while reading through the problem was, wow – this is what the Common Core problem-solving is all about, but unfortunately, NOT what we are actually seeing in the classroom. Fifth, teachers from all over the world have the same vision – to help students love math, to help students use technology to engage and expand mathematical understanding, and to help students become mathematical problem-solvers. While everyone was doing these things in slightly different ways, and some to more extremes than others, everyone was clearly motivated to help make mathematics engaging, understandable, and applicable. good and the bad. They listened, they asked questions, and they really wanted to know what they could do to support mathematics education. It was an incredibly informative two days of collaboration between those in the field teaching and those creating the tools being used by teachers and students. So – the beginning of my Casio adventure was exciting and interesting and gave me a global perspective I did not have before. With that, I now hope to continue to learn and share my thoughts and opinions about math education and how Casio, as a global manufacturer of mathematical tools, can support teachers, students and mathematics education. Would love any ideas, questions, suggestions about things you would like to hear about related to math education, so please feel free to share some with me so I can do some research and hopefully provide some answers/solutions.